Construction has started to bring a new park to the rapidly transforming Queen West Triangle area. Located south of Queen Street between Lisgar and Abell Streets in Toronto's vibrant West Queen West, the green space and public piazza will provide a new neighbourhood focal point with recreation, relaxation, gathering and event space for the many residents who have moved into the area over the past few years, and who continue to arrive as more condominiums are completed on surrounding properties. A comparison between the rendering above and the 2012 Apple Maps image below shows the site where the park will be located, currently made up of an underused green space, a Green P Parking lot, and the former site of an early 1900s warehouse now used to store construction equipment. Two condominium projects surrounding the park have been added since the Apple Maps image was created, and can be seen in the panoramic image below. Edge on Triangle Park (completing later this year) is the double-towered project which can be seen behind the green space, while Epic on Triangle Park (completing next year) can be seen behind the fenced off construction storage site at right. While the Green P parking lot will be relocated to a sheltered location in Epic, Edge will feature the Toronto Media Arts Centre, or TMAC, with front doors directly accessing the new park. The new home for six arts organizations, TMAC represents nearly $10 million worth of 'Section 37' public benefits from Edge and Epic developers Urbancorp and Plaza and will provide exhibition spaces, production facilities, workshops, media archives, and a cinema. Along with the recently opened Theatre Centre across the street, and the upcoming Workman Arts Theatre at CAMH down the block, TMAC will help cement the area as one of the premier arts hubs in Canada. The nearby Artscape Youngplace and a myriad of galleries, bars, restaurants, and the famous Gladstone and Drake Hotels along Queen and adjacent streets already make this area a major cultural node. Currently known by the working title "Lisgar Park", local ward 18 Councillor Ana Bailão is asking community members to suggestions for the permanent name via her website. 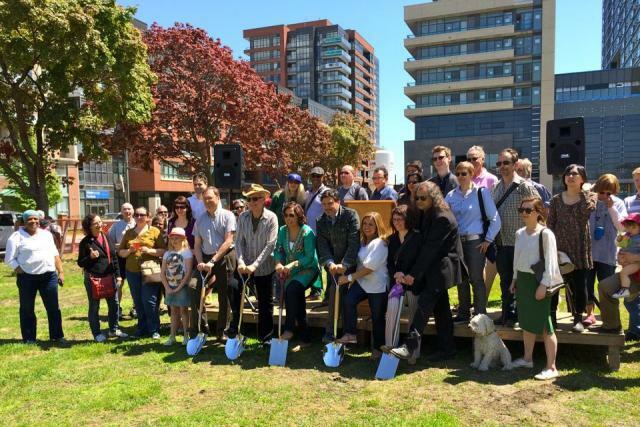 It was Bailão who officially broke ground on May 24 along with representatives of the local arts organizations, community members who participated in the extensive consultations regarding the park, and Active 18, a community group dedicated to ensuring that good urban planning choices are made in their ward. The design for the park was worked up by Victor Ford & Associates Inc. in collaboration with Oleson Worland Architects (known for their design of the well-loved Village of Yorkdale Park and Brick Works Park among others) to reflect the creative spirit of the neighbourhood through the incorporation of the community's early industrial heritage with its present artistic and innovative culture. 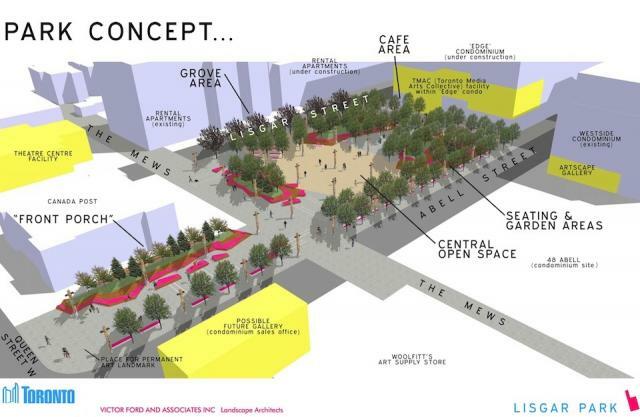 Amenities will include canopy trees, plenty of sculptural seating and planting areas, and a grid of ‘art poles.’ The poles will be fabricated primarily from structural timbers, salvaged from a recently demolished industrial building adjacent to the park site. The poles will provide park lighting, incorporating event power and cabling for a range of events. Landscaped islands will be surrounded by seating and provide a shady play area for children.